Breakfast or Dessert? 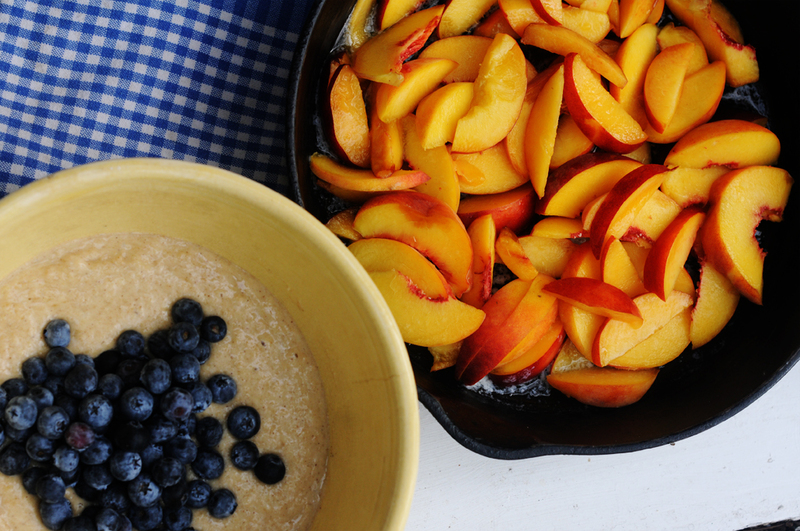 This Blueberry Peach Nectarine cobbler recipe comes right out of the FruitShare kitchen. No one can deny that fruit is a fabulous ingredient for treats and baked goods. The blueberries and stone fruits in your fruit box this week inspired us to try this great cobbler recipe that uses blueberry muffins as a topping. Keeping health in mind, we reduced sugar content from our muffin recipe and fruit filling and also substituted almond and spelt flours in place of traditional flour. If gluten-free is desired, use a rice flour blend in place of the spelt flour. Top the warm cobbler with a scoop of vanilla ice cream for a true taste of summer. Suitable for breakfast? Try this. Omit the ice cream and, instead, top with walnuts and a spoonful of fresh ricotta cheese. 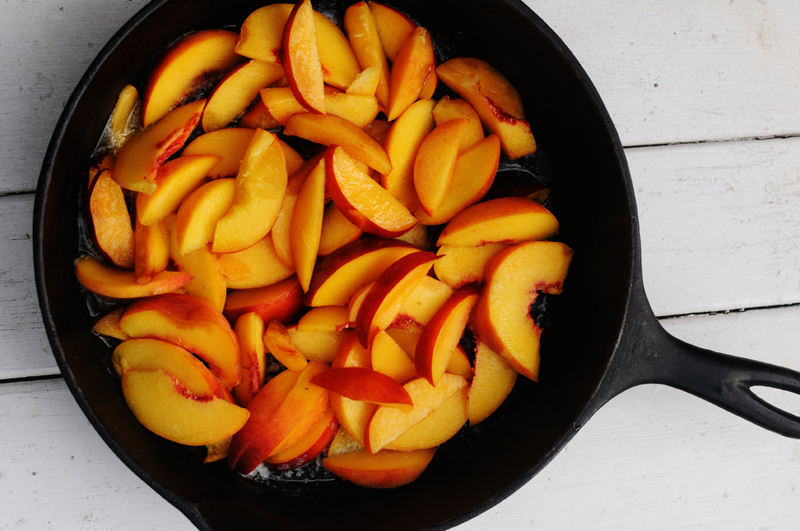 Combine sliced nectarines, peaches and a handful of berries with butter, vanilla, and if desired 1 T of sugar in sauté pan (we used a cast iron that we could also bake in the oven). Saute for 2-3 minutes and let fruit begin to bubble. In a large bowl combine almond flour, spelt flour, baking powder, baking soda, salt, cinnamon, and sugar. Create a well in the center. In another bowl , combine egg (beaten), milk, yogurt, and vanilla. Add wet ingredients to dry, stir gently until all ingredients are mixed (do not over mix). Add remaining fresh blueberries to the batter and mix. Poor batter over sautéed fruit and place pan in the oven. Bake at 350 for approx. 40-50 minutes. Fruit should bubble on the sides and muffin topping should be browned and cooked through if tested with a cake tester or knife. 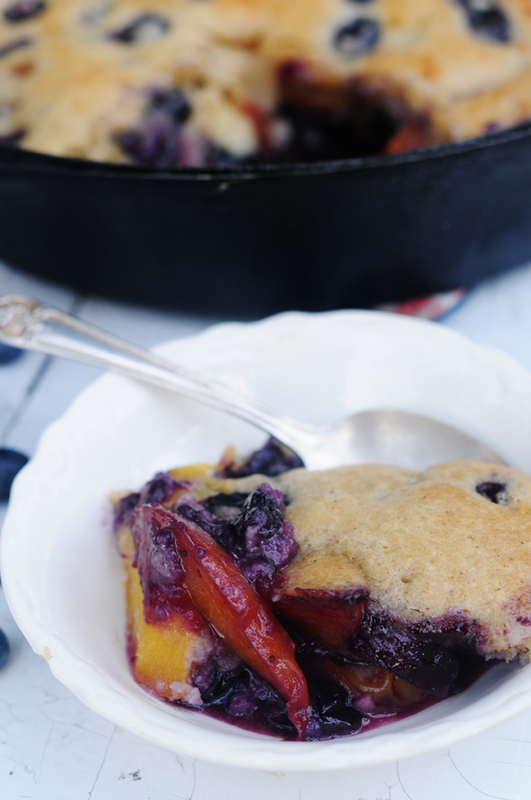 Enjoy a very special nectarine blueberry cobbler with family and friends!